Figure sets featuring German soldiers have always been extremely sought after in Dragon’s wide-ranging 1/35 scale range of model kits, and the newest item is set to build on that popularity. 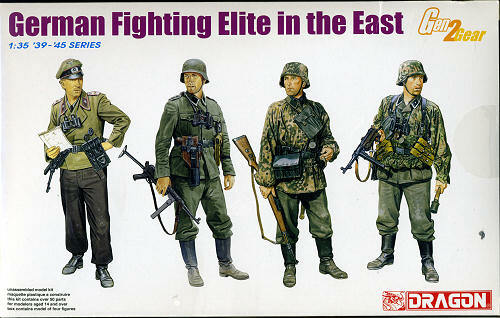 The set displays four soldiers from different elite German fighting units. They constitute a cross-section of some of the famous formations that fought at one stage or another during WWII. The figures depict various useful poses that will find application in all sorts of vignettes and dioramas. The soldiers wield weapons suitable for their unit and time period, including an MP40 submachine gun, a Kar98k rifle, a signal flare pistol and a Mauser C96 pistol. Two of the soldiers are wearing the special camouflage-pattern smocks that were so popular amongst German units, and these are well portrayed in plastic. Sharply molded and realistically sculpted, this is a versatile set that will be extremely handy for that special pose that modelers have in mind.